This weekend, the INKED OUT NJ Tattoo Convention will be happening across the river at the Meadowlands Expo Center in Secaucus, New Jersey. I will definitely be headed there to get tattooed and hang out with my favorite tattooers. Hush. This is your chance to meet some of the best tattooers, including names like “Timmy Tatts” Sellers, “Bowery Stan” Moskowitz, and Ronnie Dell’Aquila, and it’s only a bus ride away from Port Authority! For those of you who don’t recognize these names, shame on you but that’s why I’m here to help. Let’s dive in and learn a little more about these legends shall we? Timmy Tatts tattoos out of Tattoo Marks in State College, Pennsylvania. Home of my favorite cheese/coffee shop. Tim has been tattooing as long as I’ve been alive and has been able to make an awesome career working in a shop with his brother, Justin “Lowercase J” Sellers. The first thing you notice when you walk into this shop is that it looks like a goddamn museum. Not only does Timmy Tatts tattoo, but he collects vintage tattoo flash, machines, pictures, etc. like a mad man. You can’t help but feel that this might be the coolest place in the world. The walls are completely covered in vintage flash as well as work by Timmy Tatts and Lowercase J themselves. Timmy Tatts’ work truly encompasses what a tattoo is supposed to look like. You think of old school sailors and sideshow ladies and those are REAL tattoos. Luckily, Timmy Tatts is also an artist, so not only can he pump out some beautiful traditional flash style pieces but his custom work is also extraordinary. He is able to take newer ideas and turn them into old, traditional style, even if it means straying from the classical black, red, and green colors. Tattoo Marks is only a bus ride away from NYC and I highly recommend taking an adventure to Pennsylvania if you want to meet my favorite tattooer and get some ink that will last forever. The first time I met Ronnie Dell’Aquila I was at a convention in Asbury Park, NJ. Timmy Tatts had actually recommended I go get tattooed by him. Dude, this guy is rad. He’s hard as hell and super real. 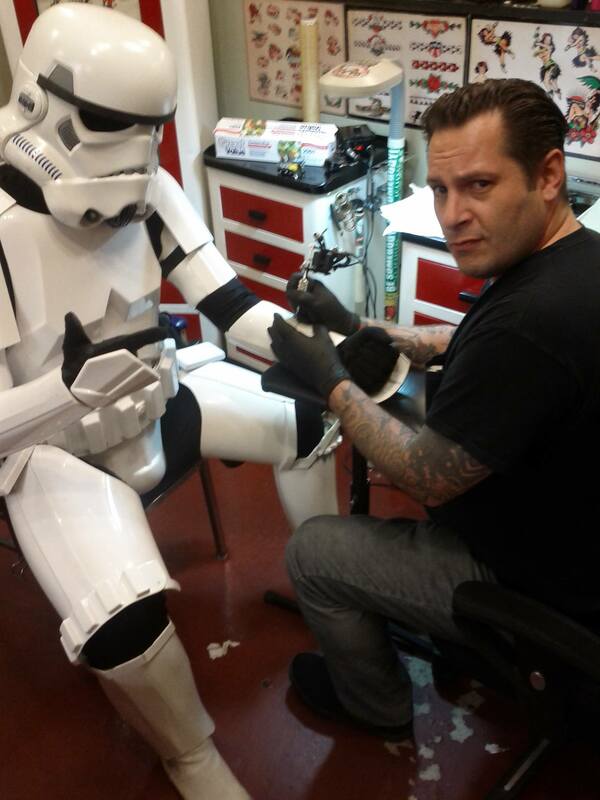 Dell’Aquila has been tattooing for over 40 years and hails from our very own Brooklyn, NY. In an interview with Fellowship Supply Co. Ronnie says he was interested in tattoos from the age of six, and he admits that by the time he was 14, the only things he cared about were girls, cars, and tattoos. In the 1960’s, tattooing became illegal in NYC but that didn’t stop Dell’Aquila from continuing to tattoo in Brooklyn, where he was once busted and cited for it. Nowadays, he tattoos out of his own shop in Stroudsburg, PA but in the same interview, admits he prefers to travel and work in shops other than his own. Dell’Aquila is one of the originals. The real deal. If you ever get the chance to see him in PA, at a convention, or as a guest at a shop, get tattooed by him. It will be the brightest tattoo you have and again, will last forever. When people talk about the old school tattooers in NYC, Bowery Stan’s name will always come up. He has been tattooing since 1948 (that’s 65 freakin’ years!). Although Bowery Stan is now in his 80’s, you can sometimes catch him still tattooing. But, unfortunately, he will not be tattooing at INKED OUT NJ. This will be first time meeting Bowery Stan even though he and Timmy Tatts are very good friends. I’m pretty sure I’m going to be a pathetic, giddy schoolgirl about it but hopefully I don’t embarrass myself too much. You, know, besides taking an obligatory picture with the legend. The great thing about tattoo conventions is that you don’t even need to get a tattoo! There will be plenty of vendors as well as events. Artists will probably be selling flash and books too. Did I forget to mention there’s a burlesque show? Now that I have your attention, hopefully my raving about these awesome artists has convinced you to make the trip to the Dirty Jerz! ← A Letter To My One True Love.